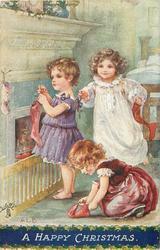 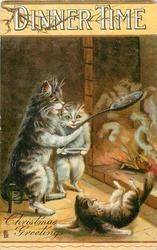 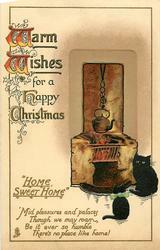 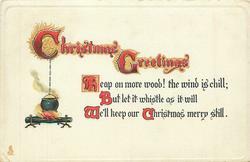 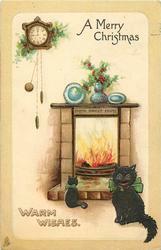 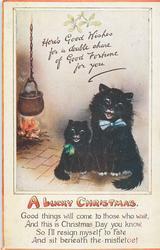 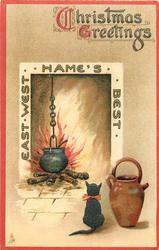 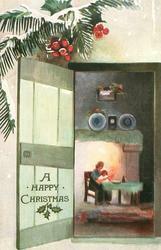 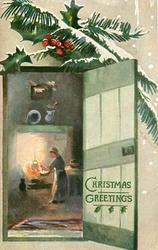 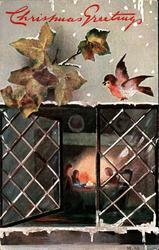 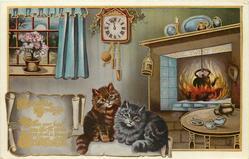 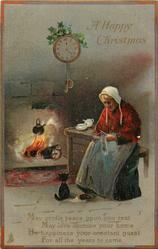 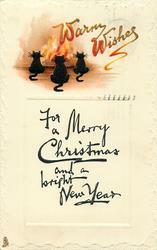 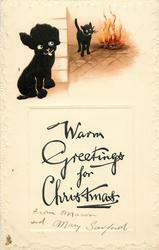 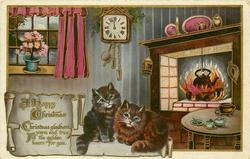 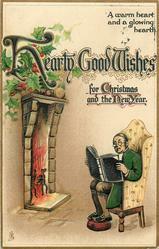 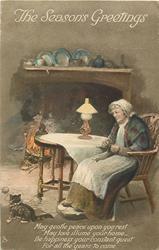 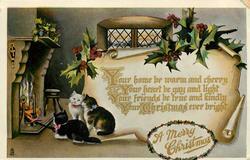 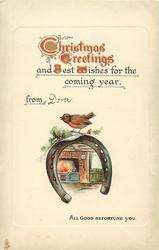 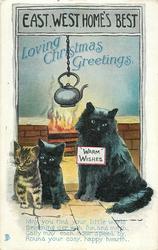 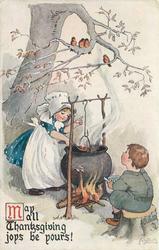 LOVING CHRISTMAS GREETINGS; WARM WISHES on card worn by cat; verse:- MAY YOU FIND YOUR LITTLE WORLD BRIMMING O'ER WITH FUN AND MIRTH, GAILY MAY EACH HOUR SPEED BY, ROUND YOUR COSY, HAPPY HEARTH. 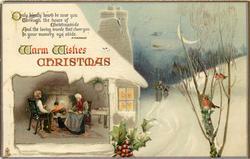 verse:- YOUR HOME BE BRIGHT AND CHEERY YOUR HEART BE GAY AND LIGHT YOUR FRIENDS BE TRUE AND KINDLY YOU CHRISTMAS EVER BRIGHT. 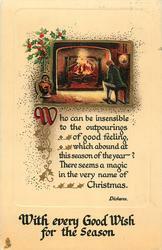 verse:- WISHING YOU A CHRISTMAS BRIGHT FULL OF PLEASURE AND DELIGHT. 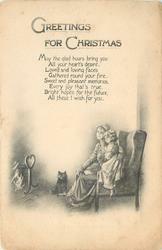 verse:- A LOVING MESSAGE JUST TO SAY MAY JOY BE YOURS THIS CHRISTMAS DAY. 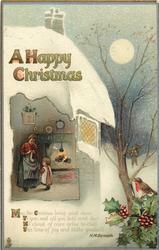 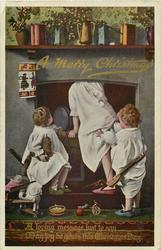 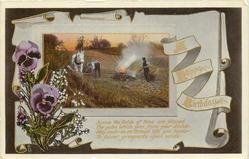 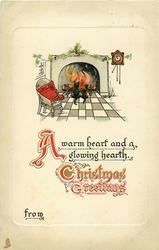 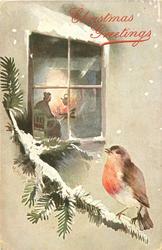 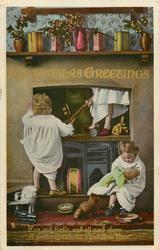 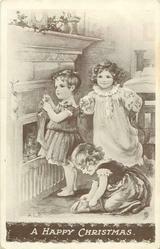 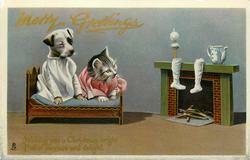 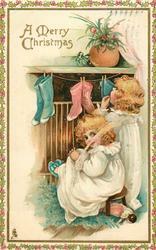 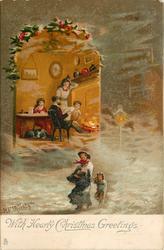 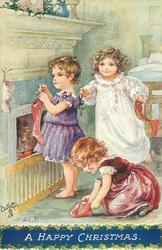 verse:- FUN AND FROLIC AND ALL GOOD CHEER A PERFECT CHRISTMAS, A GLAD NEW YEAR. 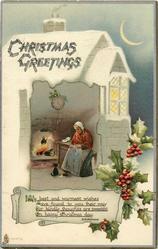 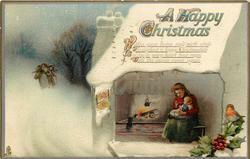 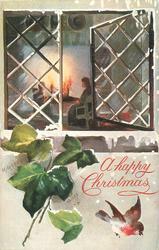 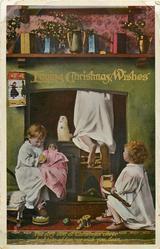 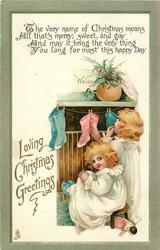 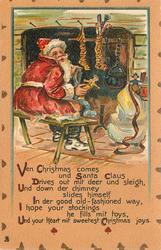 verse:- THE VERY BEST OF CHRISTMAS CHEER AND LOTS OF FUN, WE WISH YOU, DEAR. 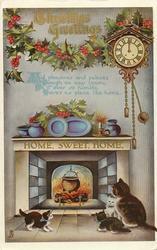 with verse "MAY THE GLAD HOURS BRING YOU..."
verse:- A COSY CORNER BY A GLOWING HEARTH IN A HOME EVER BRIGHT AND CHEERFUL BE YOURS THROUGHOUT//TO COME. 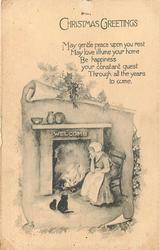 verse:- MAY GENTLE PEACE UPON YOU REST MAY LOVE ILLUME YOUR HOME- BE HAPPINESS YOUR CONSTANT//TO COME. 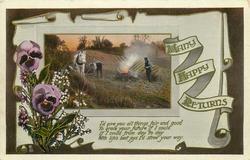 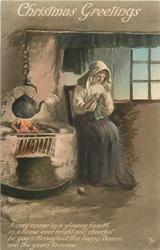 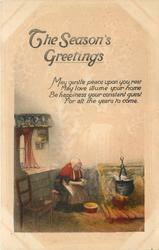 verse:- MAY GENTLE PEACE UPON YOU REST MAY LOVE ILLUME YOUR HOME BE HAPPINESS YOUR CONSTANT//YEARS TO COME. 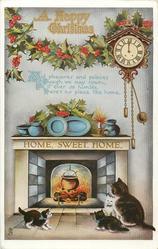 "HOME, SWEET HOME" 'MID PLEASURES AND PALACES THOUGH WE MAY ROAM, BE IT EVER SO HUMBLE THERE'S NO PLACE LIKE HOME! 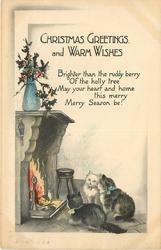 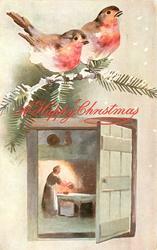 verse:- BRIGHTER THAN THE RUDDY BERRY OF THE HOLLY TREE MAY YOUR HEART AND HOME THIS MERRY MERRY SEASON BE! 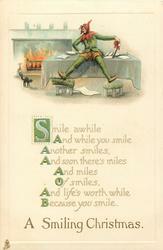 verse:- SMILE AWHILE AND WHILE YOU SMILE ANOTHER SMILES, AND SOON THERE'S MILES AND MILES OF SMILES, AND LIFE'S WORTH WHILE BECAUSE YOU SMILE.